Get the Australian BSB41415 Certificate IV in Work Health and Safety RTO training resources and assessment tools from one of Australia’s leading training resource developers! This is a premium RTO materials package which includes the quality and compliance features RTOs now need to keep up with compliance obligations. Enquire now for more information, samples and pricing for this sought-after BSB41415 RTO resource package! Get a complete BSB41415 Certificate IV in Work Health and Safety (Release 2) RTO training materials package so your RTO can deliver and assess Australia’s flagship vocational education and training (VET) qualification! 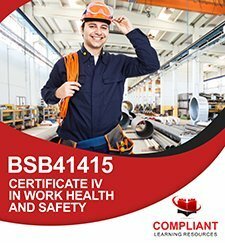 These BSB41415 Certificate IV in Work Health and Safety RTO resources and assessment materials have been designed so you can deliver quality training outcomes to your students, and produce graduates equipped to work in health and safety-related roles to provide guidance and leadership to others, or who have a large health and safety component to their job. Compliant’s BSB41415 Assessment Tools have already been used in successful addition to scope applications & audits! This RTO training resources package has been through many rounds of validation and rectification as part of an extensive ongoing development and improvement process. Of course, we always recommend you complete your own validation of the assessment tools in preparation for your application to scope audit, but with our Certificate IV in Work Health and Safety RTO training resources package, the “heavy lifting” has already been done so should require only minimal rectifications, if any. We also supply you with crucial mapping documents! All assessments in the BSB41415 RTO materials are mapped directly against the relevant unit of competency and verified to ensure every competency requirement has been assessed using appropriate methods of evidence collection. You’ll receive a complete set of mapping documents to support your validation process and to help you at audit. You will receive an unlimited student license, meaning you can deliver and assess training to as many students as you want using this BSB41415 training resource. Compliant’s package includes pre-selected elective units, clustered into a streamlined delivery package. This means you can provide a holistic training experience to your students, and enjoy efficient, cost-effective training delivery for your RTO. NB: We do NOT provide any training services. We develop RTO training materials and assessment resources for purchase and use by Australian Registered Training Organisations and other training providers. Comprehensive BSB41415 Assessment Tools Package – Validated and Written to Meet All Unit Requirements! Your BSB41415 package includes Assessment Materials for 10 units of competency, clustered into 3 “theory and knowledge” assessment workbooks plus a “project” workbook. These assessment materials have been written against the unit Performance Criteria and Assessment Requirements, then validated by compliance experts and subject matter experts to ensure the content is correct and fully mapped to unit requirements. The BSB41415 RTO materials utilise a range of assessment methods such as short answers, case studies, scenarios, practical observations, multiple choice, projects and more to form a robust portfolio of assessment evidence at the end of your students’ training. Each assessment is also mapped to unit requirements at the assessment task level, so when you are conducting validation or contextualising the vocational training materials, you can quickly and easily work out which performance criteria or assessment requirements must be addressed in your modified assessment tool to ensure all requirements are still met. Your RTO resources package will be delivered in editable digital format, so you can easily contextualise tasks, upload to your Learning Management System or otherwise distribute to your students digitally, or print hard copies of the materials for use in the classroom. For more information about the BSB41415 Certificate IV in Work Health and Safety qualification, including currency, vocational outcomes, elements, performance criteria, units requirements, course packaging and more, check the training.gov.au page here – BSB41415 Certificate IV in Work Health and Safety. Includes BSB41415 Learner Guides – No Expensive Third Party Textbooks Required! This BSB41415 training resources package includes a full set of learner guides – packed full of information and educational content for your students. These will be the “textbook” or study resource for your students while they complete this qualification. This is especially critical for the BSB41415 qualification – Learner Guides are an important tool to help demonstrate volume of learning for your BSB41415 addition to scope application. Our Learner Guides match the Assessment Materials in style and content to best help your students to prepare for assessment and make your course delivery easier. Many BSB41415 training materials on the market only include Assessment Tools. This means you will be required purchase expensive printed learner resources or third-party textbooks on a per-student basis to deliver the course. This can add tens of thousands of dollars to your course delivery costs over the lifetime of a qualification. Your BSB41415 training resources from Compliant Learning include a full set of Learner Guides in unlocked, editable digital format on an unlimited student license – meaning no expensive ongoing textbook fees! Assessment benchmarks are one of the often-overlooked elements of training resource compliance. You must have quality assessment benchmarks in your BSB41415 RTO resources so your assessors can produce consistent, correct assessment judgements. Without strong, clear assessment benchmarks, you risk having your assessors pass not-yet-competent students, leaving your RTO exposed to non-compliance at audit! Good assessment benchmarks throughout your Work Health and Safety assessment materials will help support and get better results from compliance processes such as moderation and validation too. Your BSB41415 RTO materials from Compliant Learning Resources have been specifically written as a BSB41415 resource package, meaning each unit is contextualised to this qualification. The learning and assessment materials are all written specifically for a Work Health and Safety learning context. Most off-the-shelf RTO resources are written in a “general” context, and the publisher may sell the same vocational training materials in all their packages – some common units may be used in business, human resources, marketing, and many other courses. This means you have to spend time and money to contextualise each unit to work health and safety before you can start using them in training (an important part of compliance). Not only is your Compliant BSB41415 resources package already contextualised, but you will also receive unlocked Learner Guides, Assessment Workbooks, and Assessor Guides so you can make additional changes and modifications for training or compliance! This BSB41415 package (including the Assessment Tools and Learner Guides) have been clustered to reduce the duplication of assessment tasks found in multiple units of competency. By creating clustered RTO materials, Compliant has been able to substantially reduce the volume of boring, repetitive assessment tasks so your students can focus on demonstrating all skills and knowledge in a more holistic, enjoyable manner. Marking is more efficient – reduced duplication means you don’t waste valuable time on assessing the same competencies multiple times. Less workbooks for students & admin to manage – simpler and less intimidating for everyone. Faster learning progression for students – reduced duplication and ‘holistic’ learning style helps students achieve their goals faster. Reduced assessment workload for students – great selling point for potential students. Adds additional value for your students – differentiate your RTO from competitors and offer students extra value for money. Save time and money on assessing – increase your competitiveness in a competitive training market. Helps more of your students reach their goals – great for your students and great for you RTO’s completion rates. With an unlimited use license, it doesn’t matter how many students you train. Recoup your investments with just a handful of course fees and then reap the benefits of delivering a premium clustered training and assessment resource. Compliant’s BSB41415 resource is a self-contained, one-off license RTO materials package, meaning it comes with assessment tools AND learner guides. No additional textbooks or per-student fees required. This BSB41415 Certificate IV in Work Health and Safety training and assessment tools package is supported by a ‘Virtual Workplace’ intranet site to help prepare your students for the workplace, and to provide your students with simulated assessment pathways for many tasks. This assists your RTO to deliver training to students who are not in the workplace, and international students who are not able to work in Australia. The virtual business “Awesome Landscapes” intranet site provides your students with access to a huge range of common workplace materials they require to complete their studies. This may include forms, templates, policies, procedures, case studies, scenarios, reports and other common workplace documents that students need to access or complete as part of the BSB41415 course. This virtual workplace also helps in situations where students cannot access or submit files for assessment – especially confidential workplace documents like incident reports. While your RTO or your students may wish to use real workplace documents or demonstrate skills in a real workplace for some assessments, RTOs report that the simulated Work Health and Safety organisation is a valuable asset for easy health and safety course delivery. Access to the Simulated Workplace resources is included in your upfront license fee, with no ongoing fees for use as part of this course materials package! This BSB41415 Certificate IV in Work Health and Safety RTO training resource is developed and published by Compliant Learning Resources. Licensing and support for these RTO materials will be provided by Compliant Learning Resources. Enquire now and get this premium BSB41415 Certificate IV in Work Health and Safety learning and assessment resources bundle for your RTO today! BSB41415 Certificate IV in Work Health and Safety Learning Resources Package Includes 10 Units of Competency! As part of this Certificate IV in Work Health and Safety Learning and Assessment Resource package, you will receive learner guides, assessor guides and assessor workbooks for a full 10 units of competency. We have carefully pre-selected electives to deliver learning outcomes useful in a wide range of Work Health and Safety settings. This package is for the BSB41415 (Release 2) qualification. These 10 units are clustered into three main theory and knowledge subjects covering Safety Culture and Compliance, Safety Managment Systems, and Safety in Action. The fourth assessment workbook covers the practical components of all units so students can put their skills and knowledge to the test. RTO Training Resources developed by Compliant Learning Resources are provided for a “One-Off” License Fee with Unlimited Students – meaning you pay one upfront fee and there are no ongoing per-student or annual license fees. These RTO materials are designed from the ground up for compliance and have gone through our validation and review process. However, we do understand that each auditor interprets the standards a little differently, and you need to demonstrate compliance to your auditor. If for some reason your auditor isn’t satisfied with the assessment tools and believes rectifications are required, simply contact us while the audit is ongoing as in many cases we are able to help you demonstrate to your auditor how the RTO training materials work and collect evidence of competency for each unit requirement. If the auditor still isn’t satisfied, provide us with a copy of the official audit report as it relates to this RTO training resource as soon as possible. We’ll be happy to assist with rectifications of the BSB41415 assessment tools based on the auditor’s feedback within 21 business days of receiving your audit report. This RTO training materials package was created by our own in-house development team at Compliant Learning Resources. 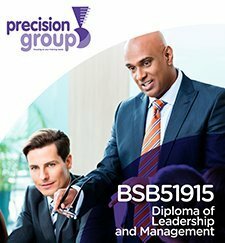 We provide ongoing support for this product in the form of quality and compliance updates as changes are made to the BSB41415 training package or we receive feedback from students, trainers and auditors. We offer direct licensing and support for this resource, simply let us know if you’re experiencing any issues with the BSB41415 RTO materials and we’ll be happy to be of assistance where possible.